Tubing taping machinery. Tape Dispenser. The tubing taping machine automatically dispenses and seals cohesive paper tape around coils of medical tubing and wire. 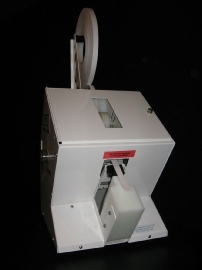 This taping machinery , tape dispenser, is used in the production and packaging of medical tubing sets and other tubing or extruded products that need to be secured without leaving an adhesive residue. 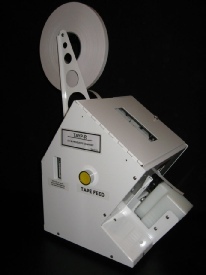 The TAYP-R will cut cohesive tape in virtually any length. The operator pushes one side of a coil into the TAYP-R and pulls it out sealed with tape. The TAYP-R prevents repetitive hand injuries by relieving stress to fingers and wrists. Taping machinery for medical tubing and extruded products.